Do you work for a company that relies heavily on virtualization of Microsoft’s enterprise applications on vSphere to drive down costs? Have you been wanting to learn the fundamentals of delivering mission-critical applications and services to a variety of devices? 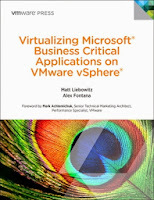 Look no further than Virtualizing Microsoft Business Critical Applications on VMware vSphere. This course covers the best practices and knowledge needed to implement Microsoft business critical applications on the vSphere platform. You can drive down costs for your company by virtualizing Microsoft’s enterprise applications on vSphere and migrate towards a more flexible and low-cost private cloud architecture. The course is presented by Libowitz and Fontana, who are experts in this field. Furthermore, it covers all parts of virtualizing Windows Server 2012 AD domain controllers and failover clusters, Exchange Server 2013, SQL Server 2012, and SharePoint Server 2013. You will also find up-to-date guidance on licensing and other issues related to ensuring full support from both Microsoft and VMware. What are you waiting for? Get the guidebook now, and delve into the fundamentals of the Microsoft and VMware worlds! It is an informative post. Keep sharing more like this.